How are you? Are you ok? It’s already 2 months down in 2019 this year looks to be off to another flying start. At the start of the year I wrote a blog (Anxiety, Netflix and Chocolate Digestives – New Year New Me (again)) about how, amongst other things, writing helped me clear my mind, get things off my chest and hopefully helped others in some way or another, however small that may be, by knowing other people were/are going through challenges in life. I also opened up the idea of “Talk to me Tuesday” where I wanted to offer an ear, shoulder, advice or whatever it may be to people who wanted someone to talk to about, well, pretty much anything. Now I am aware both these blogs are a little... erm... of a tangent shall we say, to what Big Day Print is about, but I’m ok with that and hopefully you are too, as I think it gives a bit more insight into who we are... the people behind the business. You see I was once told “people don’t but products, they buy people”. Well to some extend I agree, but that’s not why I am sat here writing this, to try and sell you something, because let’s face it, if you have reached the blog page you have either found what you are looking for or just like to read. So why am I writing these blogs, telling you deep dark secrets and sharing my thoughts? Well as I mentioned in previous blogs, one for the very selfish reason of feeling like I am helping, being heard, clearing my mind. More importantly though I want people to know us. Those that have been our customers or may become our customers should know who we are, why we are doing this, what’s in it for us as well as you? So hopefully if you are a repeat reader or you’ve stumbled across this blog for the first time and think you know what, she’s alright, she talks some sense, I want to carry on reading then the above questions will be answered over the next few blogs or for more info on who we are check out the home page on our website. Today though, I’d like to start with the why we are doing this. To give you an idea of why, I wanted to share our “core values” with you... This is a list of words we started out with on our mission to create Big Day Print and that are still true nearly 3 years later. How do I know that? 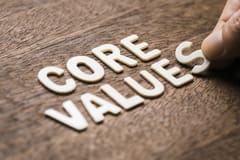 Well I recently attended a course that asked me to define our core values, after completing the exercises... guess what... they were the same. So these simple words, what are they? So what do they mean? Well this is where our mission and proposition come in. Passion – we love what we do. We are proud to be part of your special days. Mark has been designing for over 10 years (more like 15 but he says that makes him sound old) It’s not a job to him, it’s what he gets up for at 5:30 every morning. It’s what he goes to bed thinking about. It’s what he talks about at parties (true story, just ask his mum ha). And it’s that passion that I fell in love with. It’s that passion I backed to go on this adventure with. Quality – well let’s face it... we aren’t going to put all that time, effort and passion into creating your own work of art and then have shoddy finishes or paper thin card. Everything we do is done with the best care, using the latest process and machinery to create your stationery, packaged with love and sent with trust. Service – it’s just the two of us (and Loki the German Shep) but we are here. Here to help, here to advise, here to create. If you read my “Talk to me Tuesday” blog post you know I mean it. Whatever I can do to help, you’re not just one of a long line of customers. You are letting us be part of your big day, that’s huge. So we make sure it’s as important to us as it is to you. Personality – this isn’t just about us, though I like to think we are a pretty fun, friendly pair. It’s about you and your personality. The bits that make you stand out, the bits that brought you together, the bits no one else has. It’s about bringing those to life on paper for all your guests to enjoy. If you’re a board game geek, or a traveller, a sports lover or car fanatic, whatever matters to you and your day can be captured and printed ready for your guests to open and know instantly that it’s your big day. Affordable – providing quality at an affordable price was the first thing we discussed when talking about setting up the business. We wanted to create beautiful, bespoke stationery, but we had just gotten married ourselves and knew how expensive it had been. So we wanted to create that beautiful, bespoke stationery at an affordable price. This doesn’t mean cheap. It means we provide our time, skills, products, support, packaging, everything we do at a reasonable price. You know the saying, you get what you pay for, well you do... You may find it cheaper elsewhere, but will you find the same quality? The same finish? The same skill set? The same security? That’s for you to answer not us (as our answer would be very biased ha) but we also like to think we throw in a bit of fun and friendly for free too. Trust – this really ties all of the above in. You can trust you are getting quality, service, personality, custom made for you at an affordable price.